Today I’m choosing to re-run an oldie but goody. With this being the new year, majority of people are trying to get back in shape and trying to drink more water. I know my family is! I thought it would be nice to take another look at this post…especially if you forgot about it or just need a little push to infuse your water. This has been one of the most POPULAR posts for the last few months by far! 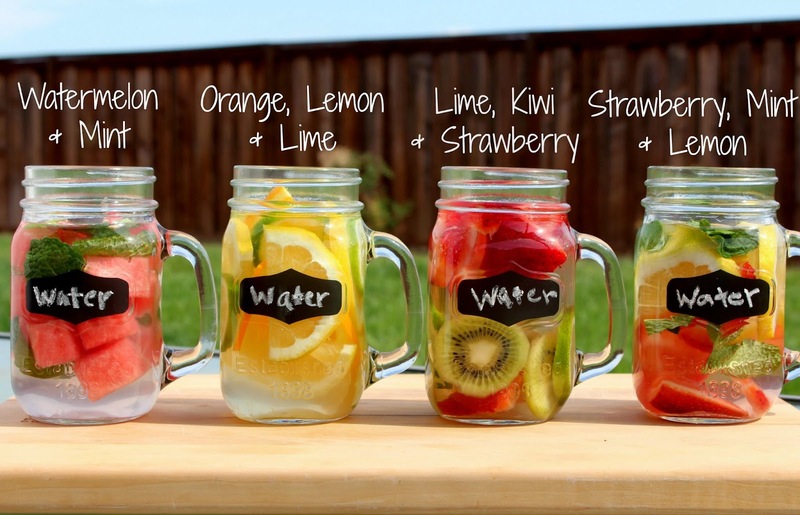 The original “Fruit Infused Water” post has been viewed over 600 times and increases everyday! Isn’t that amazing?!? Here is a fruit infused water pitcher I currently have at home and I love it…keep it in the fridge and your good to go. It was actually given to me as a present and it works great! You can pick up any of these water infusers at your local Target, Walmart etc. Keep reading below to find out great combinations and how much water you should be consuming daily. If you care to share, leave a comment below too! Water is refreshing, cool and sometimes a little BORING…but very important for your body to function correctly! Lately I have been trying real hard to get my ounces in and increase my water intake but, there is only so much you can drink with out getting tired of it. When you infuse the water with fruit, citrus or mint it brings the water alive in a very subtle way that makes it more palatable. You can play around with the combinations however you like, but these are some of my favorites. You can buy fruit infused waters at the store but those never have water and fruit, they always will have some sort of a preservative added to it. I find it fun and therapeutic cutting up the fruit and adding it to the water, finding what combinations work the best. Watermelon & Mint- Start with a glass of water, a handful of cubed watermelon, a couple sprigs of mint and some ice. Orange, Lemon & Lime- Start with a glass of water, slices of orange, lemon and lime, and a handful of ice. Once you drink all your water, you can refill the same glass with more water and reuse the fruit. You do not have to start over every time you finish your water. Strawberry, Kiwi & Lime- Start with a glass of water, 2-3 sliced strawberries, 3-4 slices of kiwi, 2-3 slices of Lime and a handful of ice. Have fun with it…your measurements do not have to be precise! The simplest water recipe is adding slices of lemon and that’s great, because when you add lemon to water it naturally detoxifies your liver. Do you know how much water YOU should be drinking?!?! 150 ÷ 2 = 75 ounces of water a day. Your weight divided in half is how many ounces you should be drinking. I hope you have fun with this and it gives you some ideas for flavoring your water at home! Here are some excerpts of my props manager/food stylist at work.